Trump’s business advisory councils are in tatters. Photo from CNNMoney. It’s time to talk jobs. Here’s what’s been in the news in the last two weeks you should know about. Business Advisory Disband: President Trump — known first and foremost for being an imposing and influential businessman — has lost support from the country’s top chief executives, as both business advisory councils collapsed last Wednesday (i.e. the Strategic and Policy Forum and the Manufacturing Jobs Initiative). Trump is maintaining he decided to disband them, while council members assert they freely chose to step away (cue chief executives for Merck, Intel, and Under Armour). 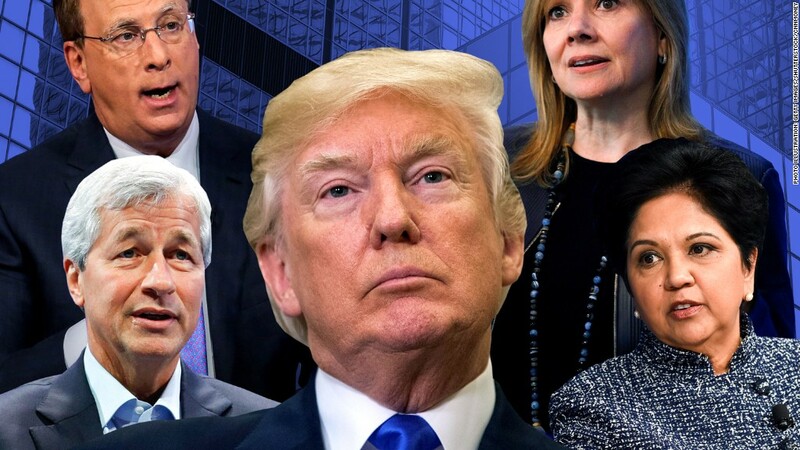 Trump’s disturbing and conflicting remarks over the violence in Charlottesville seemed to be the last straw for many of these chief executives, who have been concerned over many decisions the president has made. This is not good for a president who’s most natural constituency is the business community. Interested in what these chief executives are saying? Thanks to the New York Times, here is the highlight reel of remarks. The female perspective: The recent media spotlight on sexual harassment in Silicon Valley has seemed to spark conversations between male venture capitalists and female chief executives. Female founders of startups are fed up with the condescending remarks and sexist behavior that they are often recipients of, which serve to question their intellect and experience. We couldn’t agree more Mr. O’Donnell. Mental health day: Companies want their workers to actually take a mental health day. Workers who take a “mental health day” in order to catch up on yard work or extend their weekend provide a disservice to employees who wish to engage in activities that attend to their mental health — such as see a therapist. Employees have typically been hesitant to come forward to their managers about their mental health needs, and more companies are working to de-stigmatize mental health. Nice to see executives taking steps to create a more inclusive (and happy!) work culture. Any job vs. no job: Having any job is better than no job at all. Right? Maybe? This piece in The Atlantic shows it’s more complicated than that. A new study published in the International Journal of Epidemiology asserts that simply working any job is not enough to ward off the physical and mental effects unemployment has shown to have on people. Factors such as how anxious a particular job makes a person, job satisfaction, job security and compensation all play a major role on the body’s endocrine and immune systems (yikes). Bottom line: Having any job is NOT better than no job at all when it comes to personal health. Take big risks: This is the motto that Norwegian airline CEO Bjorn Kjos runs his business on. The airline, now the third-largest low cost carrier in Europe, is worth just shy of $1 billion. This is an interesting read about how the man behind Norwegian — the airline that has been in the center of controversy around its hiring practices and cost-cutting strategies — built his company. Have customers, will travel: Companies should exist to empower their teams and serve their customers, a belief that Gusto founder Josh Reeves took to heart — and the open road. He visited 11 cities in 10 states over two weeks, traveling in an RV, to hear straight from the mouths of small-business owners what their goals are and the challenges they face. Reeves came away with many important lessons for Silicon Valley companies from small businesses that go the extra mile for their teams. Top of the list: “If startups focused more on people instead of numbers such as headcount, funding, growth and valuations, we would all be making better products, building better cultures inside our companies and creating stronger communities.” Amen to that. WeWork gets a boost: The Japanese conglomerate SoftBank has decided to invest $4.4 billion out of its Vision Fund in WeWork — one of the fastest growing startups to provide shared workspaces. Three billion dollars are set to go straight to the company itself, while the remaining $1.4 billion will be allocated towards expanding the startup’s Asian operations. WeWork currently holds 150,000 members who utilize company spaces in 160 locations. SoftBank stated it made the investment in large part because it believed in the way the company was radically transforming the way people work. The Atlantic’s “On the Shoulders of Giants” series has a great new piece this week focused on the difficulties women can have in finding male mentors. Carloline Kitchener interviews UCLA psychology and gender professor Kim Elsesser to highlight the complexities of the roles gender plays in mentorship. Elsessor reports that the problem lies in our perceptions of male-female relationships that are not romantic; men often feel uncomfortable spending alone time with a woman who is not his wife because of how it might be perceived. And while this might be a great show of respect for his marriage, it puts women in the workforce at a disadvantage because mentoring relationships are often solidified outside of working hours. This problem is furthered by the fact that women only make up 4 percent of CEO positions at Fortune 500 companies; men are hesitant to take on a female mentee, but female business leaders are hard-pressed to find successful female executives to mentor them. Dogfish Head is in need of a new brewer! The brewer will work within the brewing team responsible for day-to-day brewing operations — including handling raw materials and overseeing each step in the brewing process. Love of beer is a must, along with two years of brewing experience. Perhaps the best aspects of this job, however, are the perks. Not only does Dogfish Head offer competitive compensation with bonus potential, 401k company match and a great healthcare package, but FREE BEER.